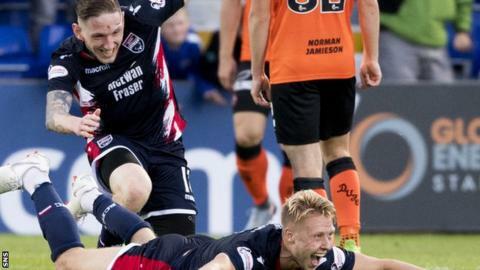 Jamie Lindsay's late header and a Scott Fox penalty save helped Ross County defeat Dundee United and go clear at the top of Scottish League Cup Group A.
Alloa beat Arbroath in a six-goal Indodrill Stadium thriller. Montrose held onto top spot in Group B with a single-goal win over East Fife, with Falkirk also winning in the group against Forfar Athletic. In Group C, Inverness CT recovered from falling behind to Cowdenbeath to win 5-2 and leapfrog them into first place. There were five goals in the first 30 minutes between Alloa Athletic and Arbroath in Group A. Two goals in a minute gave Alloa a dream start, Greig Spence's left-foot strike added to by Lewis Toshney's own goal. The visitors roared back through Ryan Wallace then Kane Hester, only for Alloa to retake the lead when Alan Trouten netted the rebound after striking the post. And they made it 4-2 before half-time with Spence grabbing his second of the game. After 82 minutes without a goal between Ross County and Dundee United, Nicky Clark had the chance to break the deadlock from the penalty spot. However, Fox's double-save kept the scores level. That would not be the last of the action. Lindsay rubbed salt in United's wounds when he headed County ahead just three minutes later. And Davis Keillor-Dunn passed up the chance of a second when he volleyed wide from close range. Elgin City did not play on Tuesday night. In Group B, Forfar could not turn their first-half dominance into a goal away to Falkirk, twice hitting a post while Jamie Bain had a penalty saved. They were punished for their profligacy when Falkirk took the lead through Dennon Lewis at the start of the second half. Poor goalkeeping contributed to the second, Marc McCallum racing from goal but being beaten to the ball by Deimantas Petravicius, who cut inside him and finished. At Links Park, after a goalless first half, Danny Cavanagh gave Montrose the three points, notching the only goal of the game with a fine low finish. The newly-promoted League One side remain at the group summit, with Premiership St Johnstone, who sit third, not in action on Tuesday. In the only game being played in Group C, Jordyn Sheerin gave Cowdenbeath a 24th-minute lead at home to Inverness Caledonian Thistle. However, Tom Walsh levelled with his first goal for the Highland club when he collected a Jordan White knockdown and smashed home. And Walsh soon scored again - finishing off a fine solo run - before Aaron Doran made it three on the stroke of half-time from another White assist. Doran was agonisingly close to making it four - his shot was cleared off the line by Kyle Miller after the goalkeeper could not hold the powerful effort - and Walsh went close to a hat-trick, whistling an effort just wide with 20 minutes to go. George Oakley did eventually bag Caley Thistle's fourth, though, when he got to the rebound first after White's shot was saved, and it was five when Charlie Trafford's shot deflected off Doran and in. Sheerin had the final say when he scored his and Cowdenbeath's second a minute later after being put clean through on goal. Elsewhere in the group, Highland League Cove Rangers host top-flight Hearts on Wednesday, while Raith Rovers are without a game until the Premiership side travel to Stark's Park on Saturday.